One of my favorite things about dining at Tommy Bahama is their cool, Hawaiian vibe. 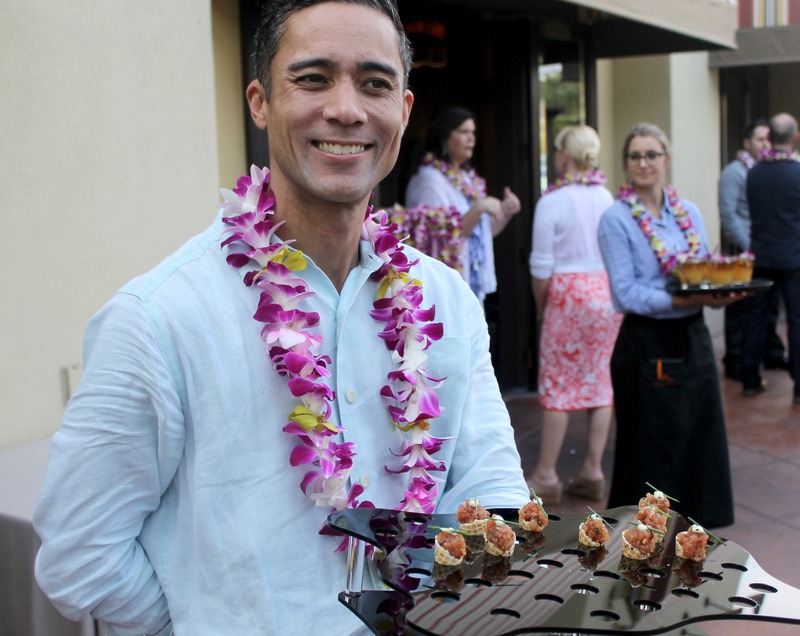 So when I was invited to attend the Tommy Bahama Flavors of Aloha event to celebrate chef Rick Rodgers’ new cookbook, I jumped at the chance to attend. Flavors of Aloha is a cookbook exclusive to Tommy Bahama, and the recipes are all traditional Hawaiian-inspired dishes with a few unique twists here and there. I’m personally a big fan of traditional Hawaiian cuisine, and loved how this cookbook paid homage to some of the islands’ signature flavors. Our evening started with a cocktail hour complete with leis, mai tais, and passed appetizers from the book. 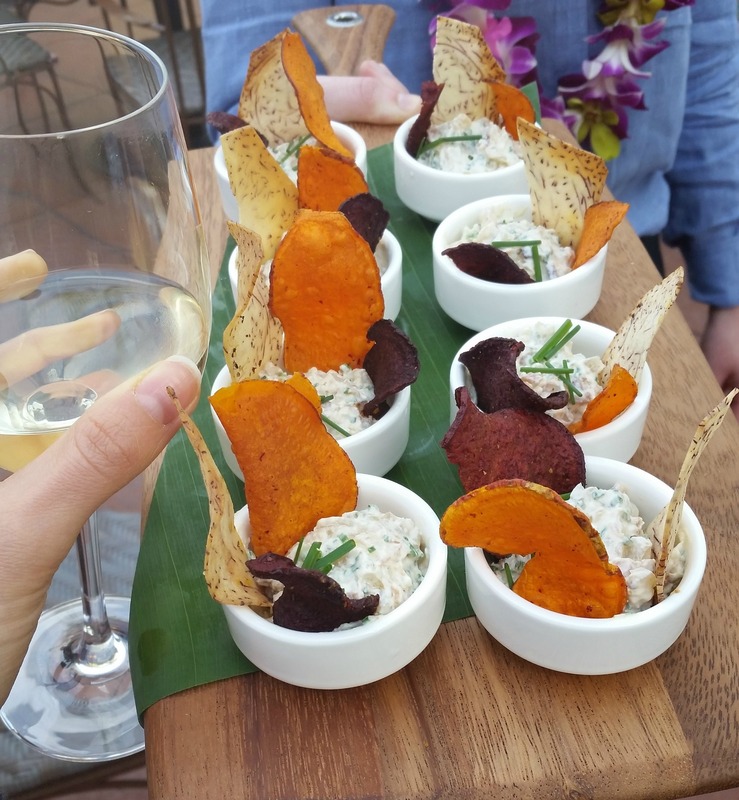 My favorite appetizer by far was the Maui onion dip which was made with fresh onion, bacon and chives and served with taro root chips. Some of the other appetizers that were served included ahi poke in little cones, spam musubi (think spam sushi) and coconut shrimp. I should also note that all these appetizers are in the Flavors of Aloha cookbook and can be found at Tommy Bahama restaurants. Then it was time for dinner. I had already informed the team of my food allergies so my meal was slightly different from everyone else but still quite delicious (also huge thank you to Orisi PR for helping me out!). 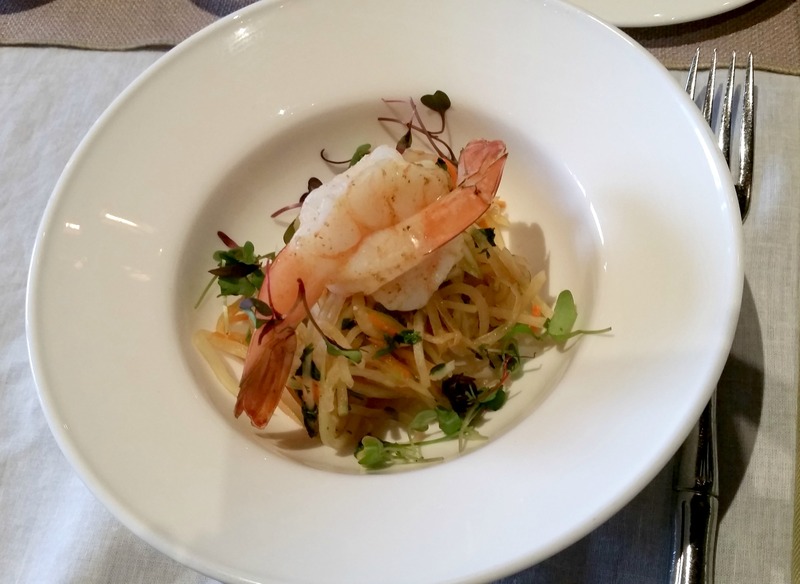 The first course that was served was a raw shaved papaya salad with chilled shrimp on top. My lovely date for the evening Joelle was kind enough to give me her shrimp so I could taste part of the dish. 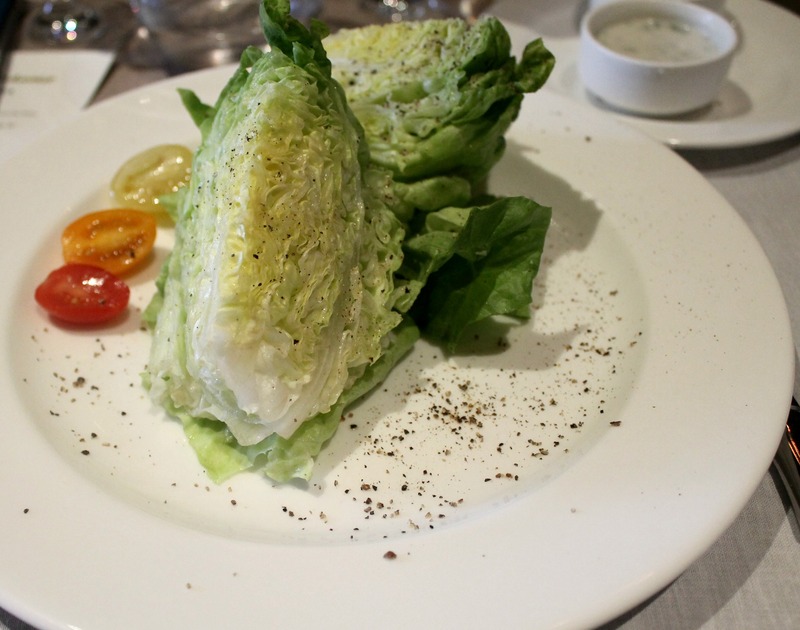 I had a wedge salad with blue cheese and fresh tomatoes which was also quite delicious. 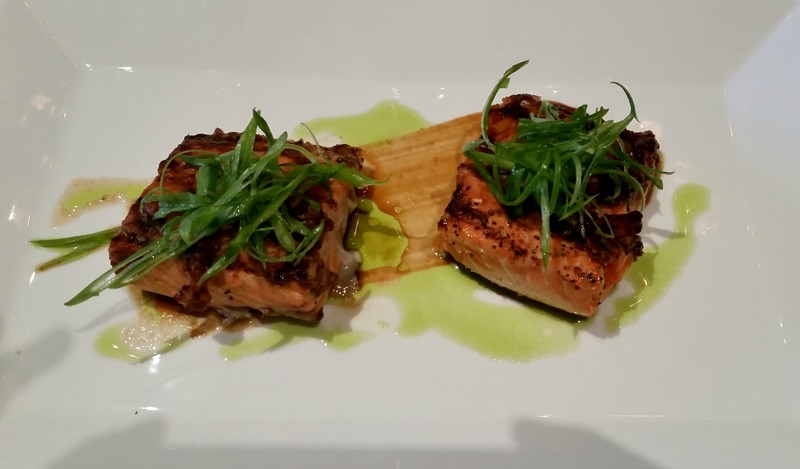 For our main course, we were served two proteins: Kona coffee rubbed steak and grilled salmon. I was served two pieces of salmon (minus the soy glaze) which ended up being quite fortuitous for this salmon lover. For the grand dessert finale we were served either pina colada cake or my personal favorite, the vanilla creme brulee in a PINEAPPLE. I packed up the pina colada cake for the Englishman, but the creme brulee was all mine. A big thank you to Chef Rick Rodgers and Orisi PR for hosting such a wonderful event! I can’t wait to dig into the Flavors of Aloha cookbook and create some of the recipes for myself. 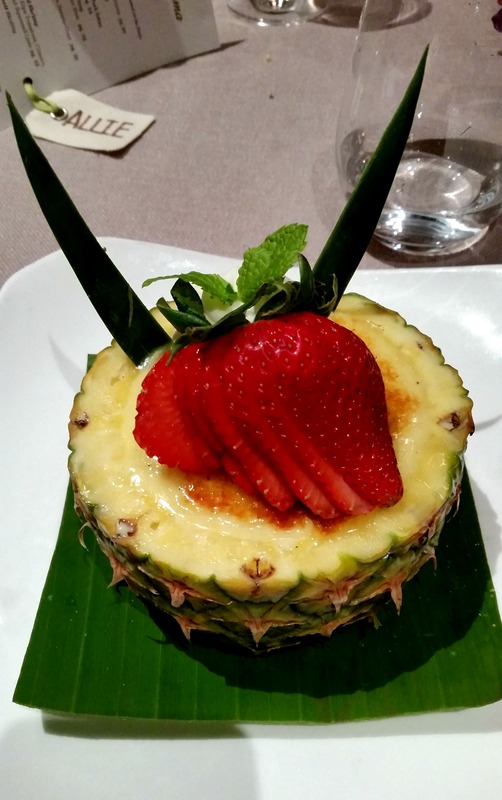 And make a return trip to Tommy Bahama for some more creme brulee. This entry was posted in Best Of, California, Food Bloggers, Good Eats, Orange County and tagged blogger event, cookbook, Hawaii on May 12, 2015 by allie@sweetpotatobites.